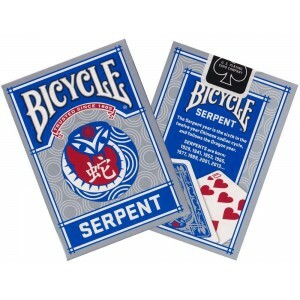 Bicycle Serpent Playing Cards were inspired by the twelve year Chinese Zodiac. Intelligent, hardworking, and plans life carefully. Wise, cleaver and analytical in dealing with challenges. Lucky with money and relationships. protective of those close to them. Can have an air of mystery. Compatible with Rooster and Ox; Avoid the pig, Monkey and Tiger. Tuck Box: The front of the Tuck box says "Bicycle Trusted Since 1885, Serpent". The back of the tuck box shows the back design. 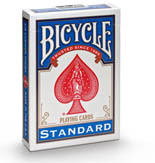 Stock: Traditional Bicycle with softly beveled edges and sandwich construction for enhanced game play. Customization: Ace of spades and back design. Additional Cards: An ad card and a Serpent Year descriptive card.